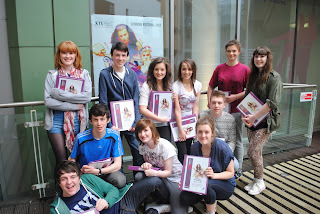 Drama enthusiasts from across Scotland descended on The Old Sheriff Court (Scottish Youth Theatre h.q) this week to begin intensive rehearsals for the annual Summer Festival. The five week Performance and Production course will see participants rehearse six days a week for up to twelve hours, take part in master classes led by industry professionals and perform in large scale productions open to public audiences. After focussing on all things horror last year, Summer Festival 2012 will this year focus on all things Shakespeare whilst incorporating dynamic and contemporary twists to the bard’s classical works. “2012 is the World Festival of Shakespeare so we wanted to acknowledge this and at the same time put a unique spin on things” says SYT Artistic Director Mary McCluskey. The main house productions this year include Twelfth Night at the Tron Theatre Glasgow; A Midsummer Night’s Dream as part of the Fringe at the Royal Botanic Garden Edinburgh and a devised production ‘An Eye For An Eye’, based on the blood bath that is Titus Andronicus, at the Brian Cox Studio at Scottish Youth Theatre. This year’s Festival sees the inclusion of the new Performance and Production Learning Programme, a six week course that boasts SQA and SCQF accreditation. Fraser MacLeod, Associate Artistic Director explains why this is such a significant move for the organisation: “This is a major step forward for Scottish Youth Theatre. The work we deliver has been officially recognised as offering educational merit and the young people that take part in the course will now, on completion, have a tangible qualification to show for it”. During the summer months when everyone else normally take the opportunity to relax and wind down, Scotland’s national theatre ‘for&by’ young people are at their busiest. Just last week, SYT Productions (SYT’s in-house performance group) toured new play ‘The Weegie Board – A West Of Scotland Ghost Story’ to London as part of the Cultural Olympiad. The spine chilling tale about a group of friends meddling in the occult went down a storm with teenagers. The other end of the age spectrum is also well catered for with SYT’s hugely popular Family Storytime sessions going out on tour around shopping malls in Scotland in conjunction with the Daily Record’s ‘Big Read’ tour. These interactive story telling sessions are tailored for 3-7’s and the whole family, encouraging audiences to get involved, bring their imaginations and become part of the story. “When the Daily Record approached us to be involved in the Big Read, we couldn’t turn it down, it was just a perfect match” comments Associate Director for Early Years Karen McGrady-Parker. “The first weekend in Stirling was a huge success with audiences at the Thistle Centre and we’ll be out on tour at shopping centres around Scotland for the next month so there’s plenty of opportunity for families to catch a performance”.